- Text reads: "I believe in Dragons, Good Men and Other FANTASY CREATURES". You'll have other drivers laughing and nodding their heads in agreement with this funny bumper sticker. Don't give up hope, ladies. Good men do exist. I saw one just last week when I was riding my unicorn. "I Believe in Dragons…" bumper sticker measures 11 1/2" by 3". This high quality vinyl decal is resistant to UV and water, and is made to last. 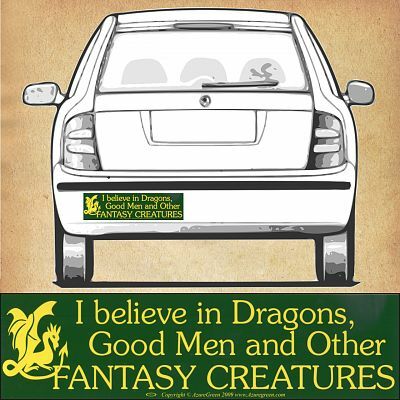 Do you have any other questions about our "I Believe in Dragons…" Bumper Sticker? Cute, put it on my car right away.